One of my little pleasures in life is watching America’s Test Kitchen. While goofy and geeky (perhaps that’s why I like it), the team behind the show delivers interesting and informative recipes that make it easy to improve your cooking. Recently, I tried recreating their recipe for nut-crusted chicken cutlets and was very happy with the results. The recipe tackles the common pitfalls of nut-crusted chicken: flavorless chicken and bland, burnt, soggy, or oily crust. There are several tricks they suggest. One of the most interesting is to use panko (Japanese style breadcrumbs) which do a better job of remaining crisp. They also suggest browning the butter in a skillet and then toasting the nuts and breadcrumbs so they begin to caramelize before you ever bread the chicken cutlets. They further suggest salting the chicken and letting it rest for about thirty minutes before preparing the dish. This creates a dry brine, sealing in the chicken’s moisture. Finally, instead of frying in oil, you bake the breaded cutlets on a wire rack set above a baking sheet. This allows hot air to circulate, cooking and crisping the chicken on all sides without adding any more oil to the dish. The end result was fantastic – one of the first times I’ve had a breaded chicken cutlet that was actually moist and flavorful. The crust was crisp and buttery but not greasy or heavy. Definitely a good technique and one I will repeat! The show is produced by the publishers of Cooks Illustrated magazine. They don’t accept advertising so all their evaluations of recipes, ingredients, and equipment are made based on quality alone. Their approach to recipes is to figure out how to achieve great results consistently, eliminating the pitfalls that plague some dishes. The thing I like best about the show is that it is one of the few cooking shows on television that is actually about cooking. So much of what we see these days is about food and eating but not that much about the technique of preparing the food. It is a refreshing return to how cooking shows started out. 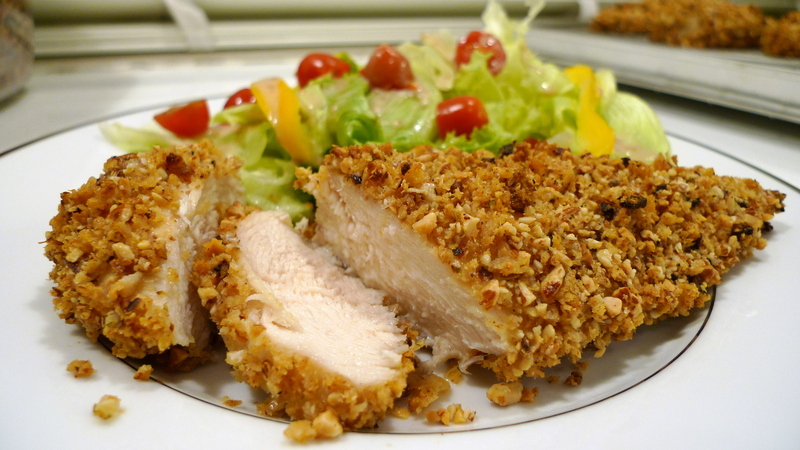 This entry was posted in Cooking, Food and tagged Americas Test Kitchen, breading, chicken, cooking, Cooks Illustrated, crusted, cutlet, food, panko by christao408. Bookmark the permalink. Gosh, I keep forgetting the warnings! Yes, I was really surprised how juicy it turned out. Never thought along the lines of toasting the bread crumbs beforehand and baking the breaded chicken before. Exactly – pretty much every episode of the show, I learn some technique that I would have never considered. Can I get that on Directv? Good question. It airs on public television in the US so not sure if your local public television station is on Directv or not. Oh yum and it looks so tender and juicy. Do you happen to have an actual recipe for that? It looks really good!